Homemade Goldfish crackers, ahoy! While there are as many cheesy crackers in the supermarket aisle as there are fish in the sea, there are certain brands that perpetually float to the top and seem to magically swim into my cart—we never really grow out of some childhood favorites, do we? 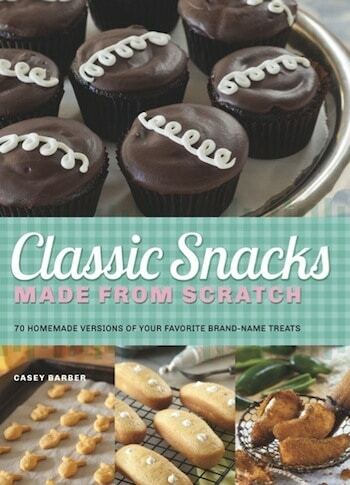 That’s why, along with homemade Cheez-Its, making my own version of cheddar Goldfish was at the top of my list when working on my cookbook Classic Snacks Made from Scratch: 70 Homemade Versions of Your Favorite Brand-Name Treats. If you’ve ever made homemade gingerbread men or sugar cookies for the holidays, you’ve already got the process down pat: just stir together an easy, cheesy dough, roll it out, cut into fishy shapes, and bake. The dough is much more pliant and supple than fragile buttery cookie dough thanks to lots of cheese and a touch of oil, and there’s no stand mixer or expensive equipment required to make it. Speaking of equipment: is a homemade Goldfish cracker really a Goldfish cracker if it’s not fish-shaped? If you’re bent on accuracy, you can do as I do and use this USA-made copper fish-shaped cookie cutter. But if your cookie cutter collection already contains a mini heart, star, circle, or other tiny shape, the taste will be the same. In a pinch, use a pizza cutter to slice out little diamonds or rectangles. In my quest to make these cute little crackers taste as much like the store-bought version as possible, I added one “splurge” ingredient to really seal the deal: King Arthur Flour Vermont cheese powder. While you can find other versions from other brands at specialty grocery stores and big-box stores like Walmart, he King Arthur Flour version is pure Vermont cheddar cheese. It’s so tart, tangy, and creamy that it’s become indispensable in my kitchen. 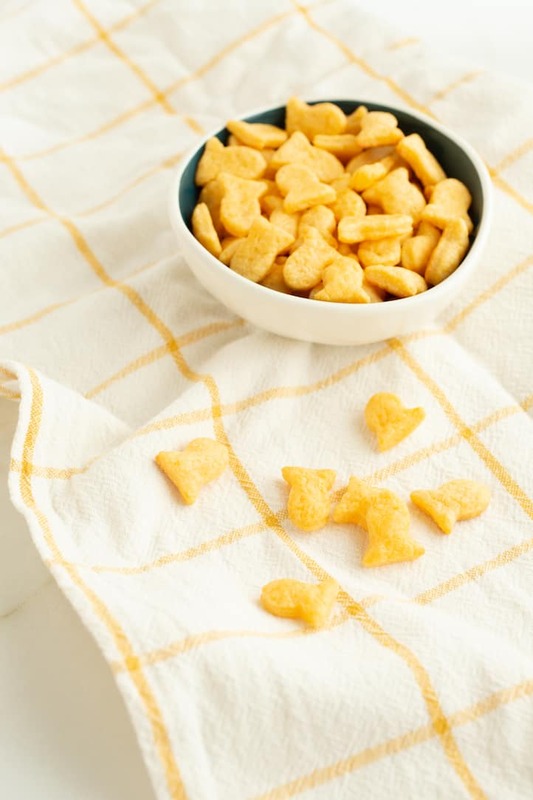 In addition to the homemade Goldfish crackers recipe, I use the cheese powder as a crucial ingredient in Classic Snacks Made from Scratch‘s recipes for homemade Cool Ranch and Nacho Doritos, Cheetos, cheddar popcorn, and more. Plus, it makes a hell of a homemade mac and cheese when you’re feeling Kraft-y but also a little virtuous. So it’s worth getting your hands on this generous half-pound tub to see what you can do with it. 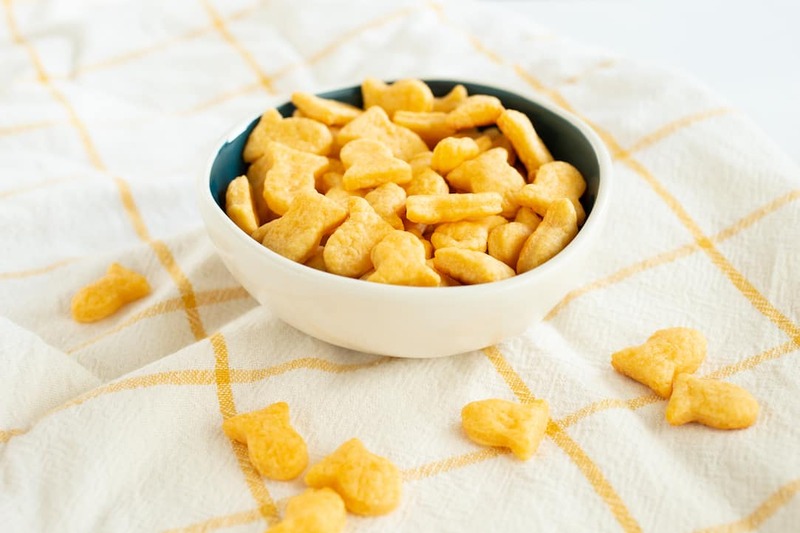 These homemade Goldfish crackers have been heartily approved many times over by the under-six set—they were the centerpiece snack at all my book tour stops, road-tested at kids’ cooking classes, and sneakily scarfed down by many grown-ups at parties over the past five years. 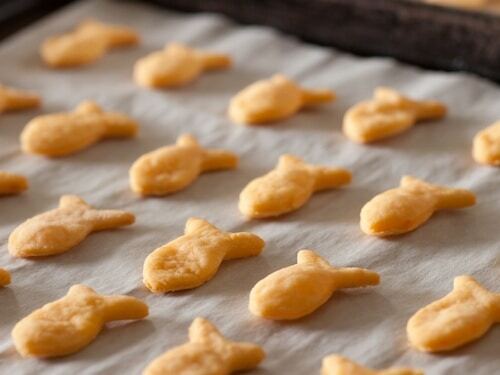 While making your own crackers will never be quite as easy as ripping open a bag, this way of getting your Goldfish is a lot more fun. Watch the video and get the recipe below, courtesy of Classic Snacks Made from Scratch! 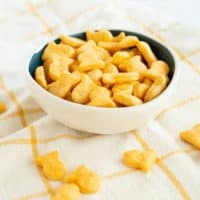 Homemade Goldfish crackers from the cookbook Classic Snacks Made from Scratch: 70 Homemade Versions of Your Favorite Brand-Name Treats are easy to make with ingredients you recognize—and just as crispy, cheesy, and addictive as the ones from the store. Stir the cheese, flours, cheddar cheese powder, salt, baking powder, and onion powder together in a large bowl until the cheese is evenly distributed and coated. Add the milk and vegetable oil and continue to stir with a spatula, then knead in the bowl with your hands until a cohesive dough forms. It will be crumbly at first, but continue to press and knead the dough until any dry bits are incorporated. Transfer the dough to your work surface, cover with the upside-down bowl, and let rest for 10 minutes. Preheat the oven to 375 degrees F. Line 2 baking sheets with parchment paper or Silpat liners. 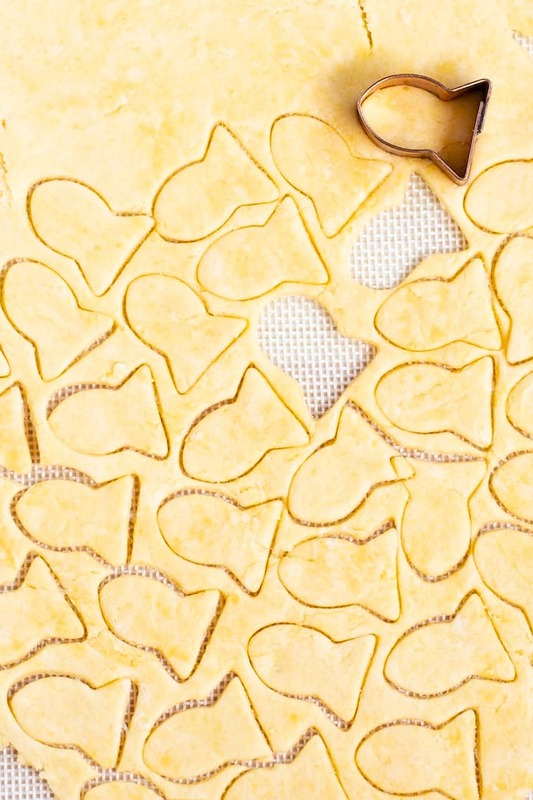 Stamp out cracker shapes with your cookie cutter of choice: a fish is the traditional shape, of course, but the crackers taste just as good as hearts, stars, circles, or small squares. Transfer the shapes to the prepared baking sheets. Bake for approximately 15 minutes, until the crackers are crispy and just turning golden at the edges. The timing will vary according to the size and shape of your crackers. The crackers will soften when kept in an airtight container, so they’re best eaten within a day or two. 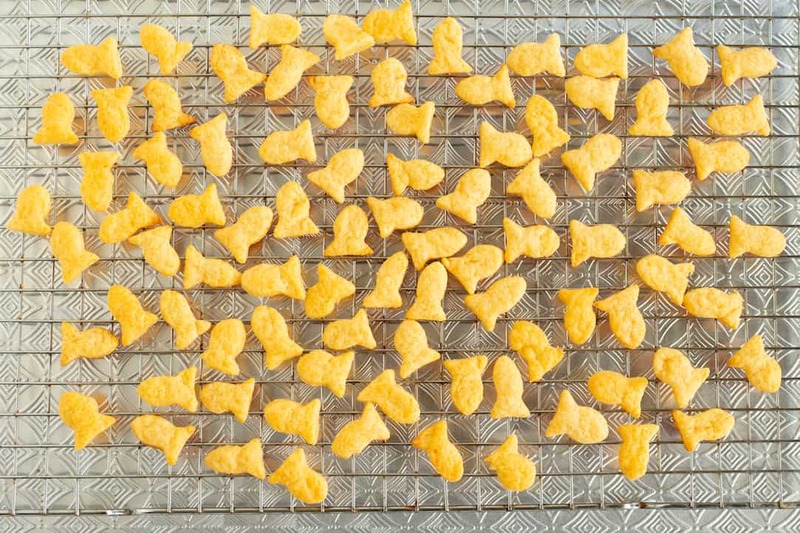 I use this fish-shaped cookie cutter to cut out my homemade Goldfish crackers, if you want to replicate the exact shape.